Vice President, Prime Minister of the UAE and Ruler of Dubai His Highness Sheikh Mohammed bin Rashid Al Maktoum said that Dubai is determined to cement its position as global business capital, as per the objectives of The Fifty-Year Charter, which aims to speed up the journey of prosperity, progress and sustainability in Dubai. His Highness said that his vision for the next 50 year focuses building upon the accomplished achievements, to reach a fully integrated city of law and the spirit of mercy and compassion, where its inhabitants enjoy prosperity and progress, as well as creating a conducive environment for future generations. "The new era requires keeping abreast of the changes that are taking place in today's world with creative thinking that anticipates the future challenges to ensure that Dubai will maintain its achievements and influential position to become a center of the world. I tasked Hamdan bin Mohammed to follow up the implementation of the various components of the Charter, and I am confident that he and his team will be able to face the challenge," His Highness said. "Dubai’s achievements have taught us to not stop on what we have already achieved, and to continue the journey looking for new opportunities for development ushered by our faith and determination for success. We are confident of our ability to overcome these challenges to achieve our objectives." Meanwhile, Crown Prince of Dubai and Chairman of the Executive Council His Highness Sheikh Hamdan bin Mohammed bin Rashid Al Maktoum, expressed his confidence in his team of Dubai Government to implement Sheikh Mohammed’s vision and achieve desired objectives. 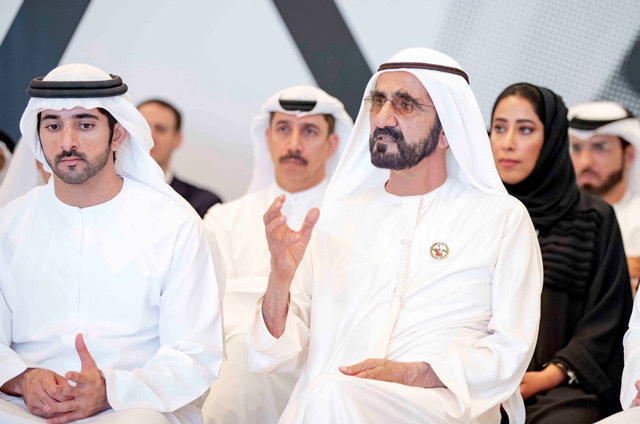 His Highness also said, during a brainstorming session of Dubai Goverment leaders, that keeping the teamwork in accordance to the Eight Principles of Dubai along with Fifty-Year Charter should be the compass of Dubai towards the future. Sheikh Mohammed also reviewed today, in Emirates Towers, the roadmap that seeks the imminent implementation of the Fifty Charter, in presence of H.H. Sheikh Hamdan bin Mohammed bin Rashid Al Maktoum, Crown Prince of Dubai and Chairman of Dubai Executive Council, and H.H. Sheikh Maktoum bin Mohammed bin Rashid Al Maktoum, Deputy Ruler of Dubai, along with Dubai government top executives and leaders. Addressing Dubai Ruler, His Highness Sheikh Hamdan said: "We promise Your Highness that will work tirelessly to achieve our objective to elevate Dubai’s value and showcase its beauty and unique identity. We have all what it takes to further cement Dubai glory and we have to show the world that Dubai is committed to its uniqueness and distinction," Sheikh Hamdan said. "Dubai is unique with its accelerated rhythm in term of development and progress, and its creativity and innovation require working together to achieve the desired objectives. The Fifty Year Charter highlights the 50 objectives that we plan to achieve this year, which dictates a new reality to reach the ultimate objective of His Highness Sheikh Mohammed bin Rashid, which requires creative thinking and efforts to implement the initiatives included in the charter. The brainstorming session included a general session that reviewed the objectives and the messages of the Fifty Charter which aims to improve life quality in Dubai, and assuring the Charter doesn’t mean neglecting the strategic plans that the government develop to promote all session. His Highness Sheikh Hamdan tasked the secretariat of the Executive Council to follow up the implementation of the Fifty Year Charter, and to liaise with concerned authority, and to periodically brief His Highness and the Executive Council on the progress made.